RevKess goes solo again for this edition of PWN. That means a little bit more music than you might usually expect, but plenty of news coverage and opinion bits. Zaracon is settling into his new living arrangement and getting used to things there. RevKess’s work schedule got turned upside down this week, adding to his already hectic schedule with rehearsals for a musical he is in this spring. This and other factors made for a one hour edition of PWN this week. It is with sadness in our hearts that we make formal announcement of the passing of Donald Michael Kraig. You can read an obituary and comments from loved ones and friends on The Wild Hunt. Westboro Baptist Church founder Fred Phelps is reported to be dying, according to a Facebook message from his estranged son Nathan Phelps. He was also excommunicated from the WBC back in August 2013, a disagreement with other elders of the church about being “kinder” to others. 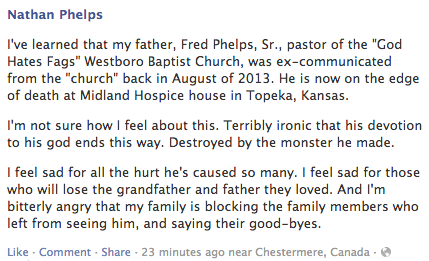 Update: Since our broadcast Wednesday morning, Fred Phelps has passed away. 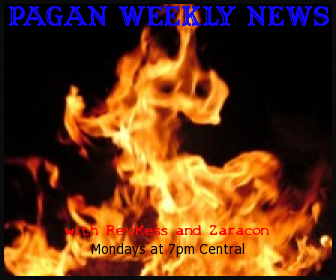 Stay tuned to PMPChannel.com for RevKess’s editorial on the life and times of Fred Phelps. Federal Judge rules in favor of the student after a creationist teachers calls his beliefs “stupid” and orders the school staff and faculty be educated on the 1st Amendment by an ACLU approved attorney. St Patrick’s Day parade boycotts in NYC and Boston. Both mayors and three major beer bottlers drop support of the St. Patrick’s Day parades in the cities. Sam Adams, Heineken and Guinness.